How to add remote access users? 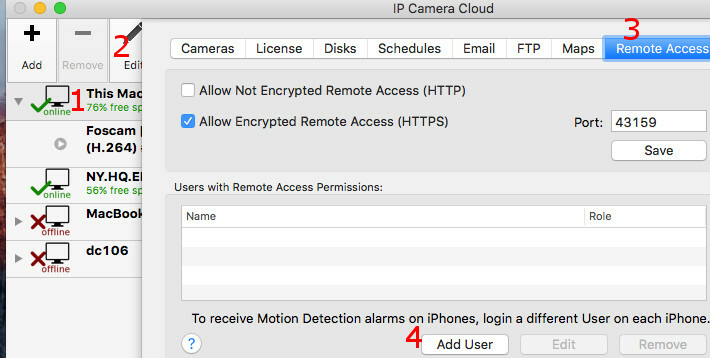 Once you setup IP Camera Cloud software on your Mac or PC, you will be able to access it remotely without any additional configuration. Simply install our remote access apps for Mac, iPhone or use a Web Browser and sign in using the same DComplex Account you used to install the server software. If you want to add remote access to another user(s), follow this guide. A. Launch IP Camera Cloud app on the server computer and add a user as shown in items 1-4 in the following screenshot. This example will allow remote access to DComplex Account support@dcomplex.com. Replace it with the Account you wish to grant access to. B. Now ask the other user (support@dcomplex.com in this example) to install IP Camera Cloud on her computer and sign in using the DComplex Account you granted access to (in this example: support@dcomplex.com). Once she is logged in, she will instantly see your computer and cameras in the Cameras Sidebar.